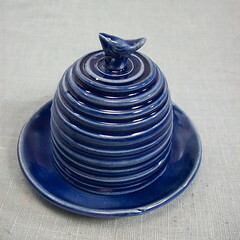 I threw a cup shape for the dome of this piece, trimmed it round, added the ridges, then made a tiny little bird to be the handle instead of throwing a knob like I usually do. There's a closer detail shot here. Instead of throwing a plain saucer to hold the butter, I threw a little cup in the center to hold about half a stick of butter, more than enough for a meal. It's not a butter crock, but headed in that direction. Next weekend is my first weekend at the Memphis Farmer's Market, so this will be for sale there. I'll have lots of herb markers, tiny bowls, honey pots, and a selection of serving pieces available, as well. Today I plan to get the rest of my green (as in unfired) pieces into the kiln to fire so that I can get them glazed this week. I am woefully short on ready-to-sell mugs.